The JI Wall 1000 SF(Secret fix) wall panel allows for an architectural solution by combining the horizontal or vertical placed panels with accessories in different aesthetic finishes, coatings and colours throughout a wide range of external profiles. Perfect for use in Industrial, Commercial and Public Buildings. In this way the building can be designed in its own unique way. The JI Wall 1150 PIR insulated panel is a multifunctional panel to be used from external wall to internal applications such as compartmentalizing and ceilings. Due to its innovative joint for core options, it is the ideal panel for cold store, freeze rooms, but also agricultural buildings such as poultry and others. 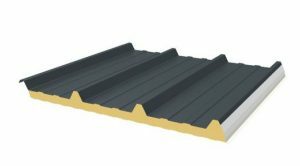 The JI1000RW LPCB certified Trapezoidal Insulated Panel is designed and manufactured as a roof panel however can be used in a horizontal or vertical wall application. It can be a cost effective way to externally insulate industrial, commercial, Agricultural and public buildings. Due to its metal inner and outer sheet, it combines thermal resistance with big spans. The panel when fitted in a horizontal position can be used as a firewall. 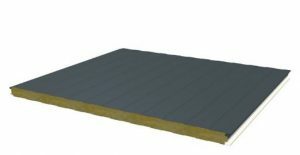 The Vulcasteel Wall 1130 VF is a mineral wool panels with liner or microrib exterior profile. Due to a maximum 4 hour fire resistance this panel is often used in agricultural, Commercial or industrial projects where high fire resistance is required.